Despite being the world's smallest photo and video light, Lume Cube AIR packs a lot of power, with high light output and wireless control. In addition to that, it’s also waterproof down to 10 meters’ depth! Photographers and filmmakers who work a lot in the field no longer need to worry about how to illuminate their motives. Lume Cube AIR is so small and lightweight that it can be carried in a jacket pocket, but provides enough power to be useful as a light for portraits and products. With help of the Lume-X app, it's even possible to remotely control multiple AIR’s and quickly and easily create an interesting lighting setup customized for the current scene! Packed with the best LED specifications available for this size, the Lume Cube AIR puts out 400 lux at 1 meter with a 60-degree beam angle. The color temperature is 5600K (daylight balanced) and has a CRI rating of +/- 90. It also comes with two diffusors to soften the light – a white for neutral color and an orange to match the color temperature of light bulbs. The built-in battery will last for 2,5 hour of continuous illumination at 50% brightness. For even longer recordings, you can also connect Lumi to a Powerbank via its micro USB connector. 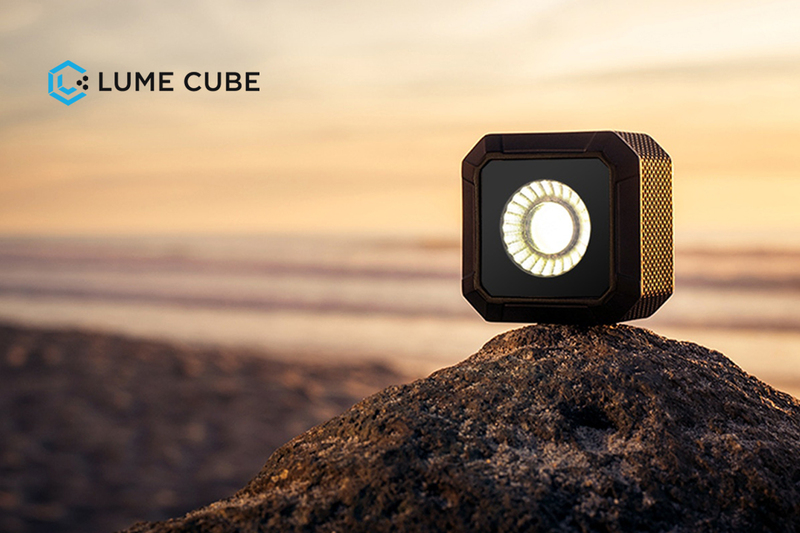 Weighing in at just 57 grams with overall dimensions of 4,1 x 4,1 x 2,9 cm, the Lume Cube AIR is the smallest and most portable light of its kind. It's also waterproof down to 10 meters and can be used in the worst imaginable weather conditions. In other words, a perfect photo lamp for shooting adventure sports, kayaking, surfing and the like. After installing the iOS or Android app Lume-X, a smartphone can be used for wireless control of brightness, light mode and the strobe function and also to monitor the battery level. Even for multiple Lume Cube AIRs simultaneously! The Bluetooth functionality and Lume-X app allows for fast adjustment of any lighting set-up, creating a truly smart mobile studio! In addition to a standard 1/4” tripod thread, the Lume Cube AIR also has a built-in magnet that allows it to be used not only for content creation but also for recreational needs or other work related tasks. Mount it as an extra light on a bicycle, car or use the flashing stroboscope mode to draw attention in emergency situations. Lume Cube AIR is available for immediate delivery.